Traditional Mirepoix is the classic French base for stocks, soups, stews, & sauces. 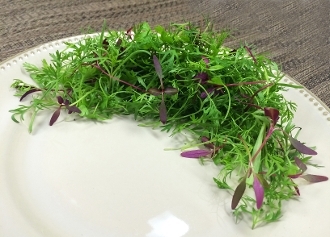 Our Micro Mirepoix Mix is a microgreen version of the carrot, onion & celery combination. Bright green colors with a spark of red and frilly textures. Amazing float on cream, veggie soups. Great topping for poultry, seafood or meat.